Vikram Iyengar is a dancer-choreographer-director, performing arts researcher and writer, arts manager and curator based in Calcutta. He is co-founder of the Kathak-based performance company, Ranan and initiator of the Pickle Factory Dance Foundation – a hub for dance and movement practice, discourse and presentation. Vikram’s work spans productions, workshops and performance collaborations; research, writing and curation projects for several arts bodies; and various organisational roles. His performance work is linked by a fundamental and continuing engagement with the kathak form and kathak-informed body. 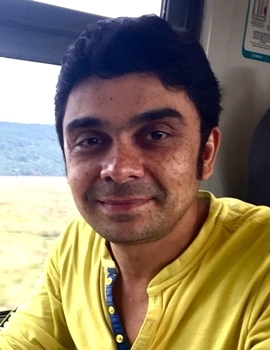 An ARThink South Asia Arts Management Fellow (2013-2014) and Global Fellow of the International Society for the Performing Arts (2017), he is one of four Asia Pacific participants in the International Arts Leaders programme run by the Australia Council for the Arts (2017-18). In 2015, Vikram was awarded the Ustad Bismillah Khan Yuva Puraskar by the Sangeet Natak Akademi in the field of contemporary dance.